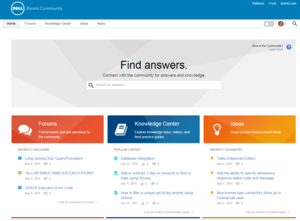 The Dell Boomi Community has long served as a key resource for our customers to find answers to their most important questions and learn best practices from their peers. Today, we announced the launch of the new and improved Dell Boomi Community which will make it even easier for developers, customers and partners to find information, collaborate, and get answers to questions related to AtomSphere® iPaaS, MDM, and API management solutions. The updates also allow visitors to discuss Dell Boomi product highlights and best practices, and join topic-based user groups, giving customers access to advice and tips from experts with experience solving similar integration challenges.